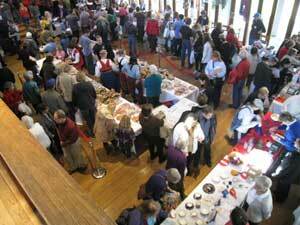 The Finnish Christmas Bazaar is an annual Washington DC holiday tradition - for over five decades now. Enjoy music and fun for the whole family, or bring a date. Find unique, imported holiday gifts from the Land of Santa Claus, then have lunch at the Christmas Cafe, serving holiday pastries, sandwiches, coffee and glögi. And buy something tasty from the Bakery Shop to take home!! From Capital Beltway: Exit 39 River Road East (to Washington). Continue about two miles. Turn left on Whittier Blvd. Enter parking lot from Whittier Blvd from 2nd gateway on left.